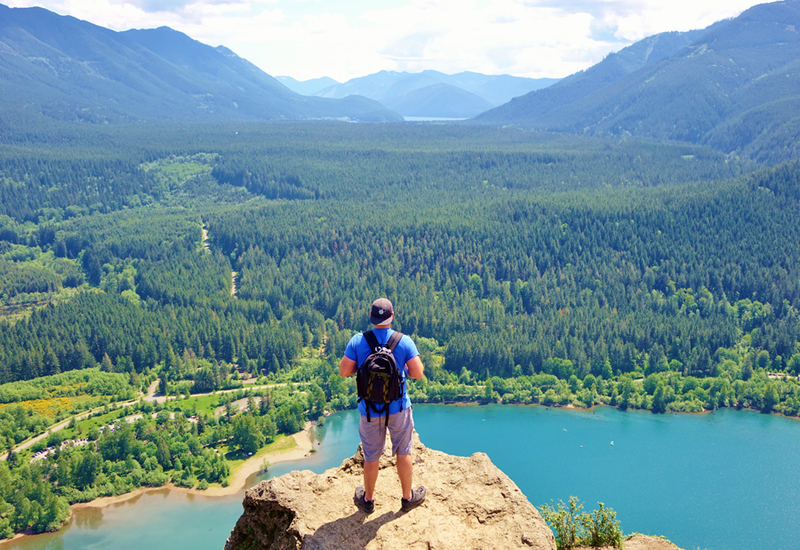 Rattlesnake Ledge offers some of the best scenic hiking close to Seattle. I’m not a hiking expert so I can’t claim that it’s the quintessential hiking trail near Seattle, but I have heard many people say this before. In addition to the breathtaking views, the trail is well maintained, an easy drive from downtown, and a good escape from the city. The directions to Rattlesnake Ledge are pretty easy. Head east on I-90 from Seattle and take exit 32 (just past the North Bend exits). Hang a right off the exit onto 436th Avenue SE, which eventually turns into Cedar Falls Road. You only drive for about three miles before you run into the parking lot for Rattlesnake Lake and Rattlesnake Ledge trail. If the parking lots are full, you may need to park on the side of the road. One thing you won’t need for this hike is a Washington State Parks Discover Pass (since it’s not a state park). 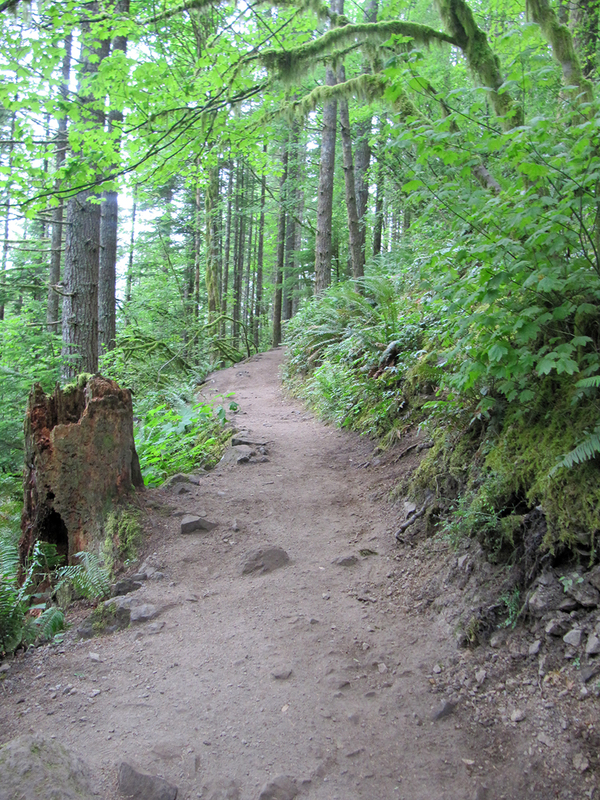 From the parking lot, the Rattlesnake Ledge trailhead is a .3 mile walk (just follow the signs around Rattlesnake Lake). The actual hike is just 1.9 miles each way. The trail is uphill the entire time, but don’t let this intimidate you. It’s an easy-to-medium uphill hike. The elevation rise isn’t too dramatic and it’s fairly steady the entire time. I saw plenty of kiddos heading up and down the hill having no problems, so I’d venture to guess even non-hikers are able to handle this trail. It took us less than 50 minutes to get to the top of Rattlesnake Ledge from the parking lot. Rattlesnake Ledge offers incredible views! As I mentioned, the trail is well maintained and is wide enough for two people to hike side-by-side for most of the trail. While the trail is well groomed, I’d still advise wearing hiking boots or sneakers. 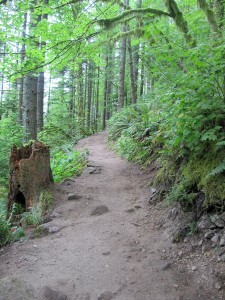 It’s a typical Western Washington trail with rocks and tree roots embedded in the trail. Sturdy shoes are a good idea. I actually spotted a few people hiking around in flip-flops and think they must be totally crazy (or, they’re friends with Tim). 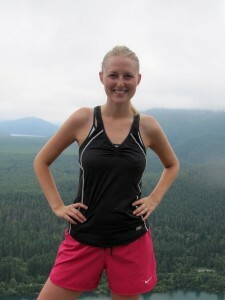 Me at the top of Rattlesnake Ledge. The entire trail is beautiful. There are huge, tall trees surrounding you. You’ll hear birds in the distance and see lots of chipmunks and slugs along the way. Once you reach the top, the view is breathtaking. The trail ends on a huge boulder overlooking Rattlesnake Lake (down where you started the hike). 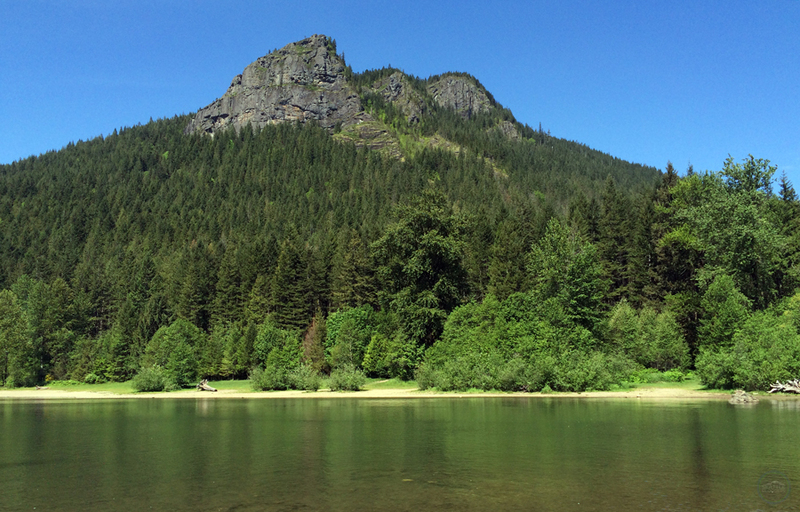 While you stand on Rattlesnake Ledge, you can also see the massive Mount Si, peaks of Snoqualmie Pass and parts of the Cedar River watershed. It is almost a 360 degree view of the surrounding, untouched forest from the top. It is quiet incredible and well worth the trek uphill. Next time I go, I plan on taking a lunch to enjoy at the top. One thing to note about this trail is that it’s very crowded. When I hiked up Rattlesnake Ledge, I estimate I passed more than 50 people heading down the trail. There were probably another 30 at the top, taking in the view. Right before I left the top to head back down to the trailhead, another group of about 20 people had just arrived. Since this is such popular hike, I wouldn’t recommend it to anyone looking for peace and quiet. 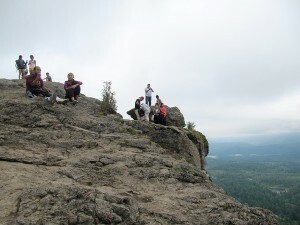 Rattlesnake Ledge is a very popular Seattle hike. Even with all the people, I’d still hit up this trail again in a heartbeat. It was a fun trail to hike. I love that it got my heartbeat up but it didn’t take too long to enjoy the reward at the end of the hike. I also really like how close it is to Seattle and that it didn’t take up my entire day. It is perfect for people who don’t have a lot of time to spare, but are still looking to get outdoors. Have you ever hiked Rattlesnake Ledge? What did you think? We’d love to hear from you. Please leave a comment below or connect with us on Twitter, Facebook and Google+. Don’t forget to also check out Seattle Bloggers for more fun recreational activities in and around the Seattle area.